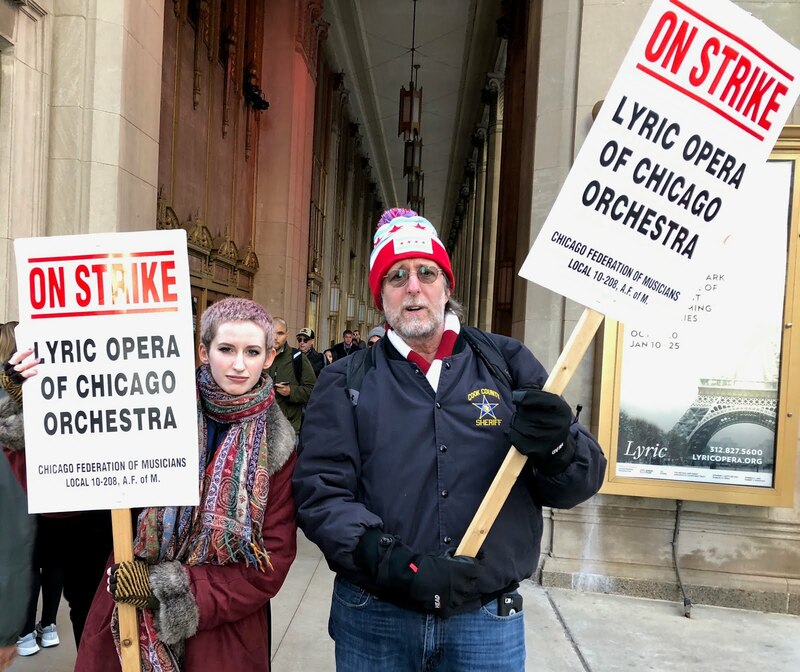 Cellist Sonia Mantell, left, and bassist Greg Sarchet picket Thursday in front of the Lyric Opera. I have friends among the musicians of the Lyric Opera of Chicago Orchestra, and also know people in its management, so would hate to take sides between the hard-working artists who create the magic and the haughty taskmasters who control it. Both sides merit equal consideration, and besides, my opinion is probably colored by the way I am often treated by the Lyric back office as I try to write about their productions—indulged when I'm singing the party line, given the backhand if I write something that displeases them. I've taken 100 readers to the opera every year for the past decade but decided, this year, that it's just too much bother, and let the practice drop, not that anybody at the Lyric seemed to notice or care. And now, as it turns out, there might not be a season anyway, due to the strike that started Tuesday, so no loss to the paper's readership, except as part of the greater loss to the city's cultural life. which is considerable. It was in this spirit of utter neutrality that I stopped by the musicians' picket line Thursday afternoon to assess the situation. It was not as dreary as most picket lines, because of the high spirits and continual music which the Chicago Federation of Musicians strikers offered to passersby for free, an arrangement that their overseers would no doubt like to continue. 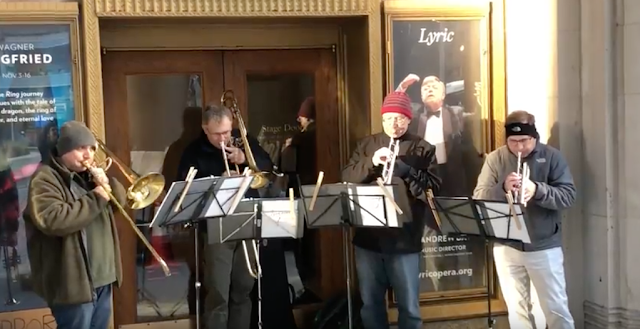 I posted a brief video of a brass quartet of strikers performing Le Jeune's "Autant En Le Vent." The issues are complicated, and are set out at the orchestra union's web site here. Chris Jones also wrote a typically-excellent analysis of the situation in the Tribune here. I did my part by speaking with Amy Hess, spokesperson for the Lyric orchestra. "We are on strike because we truly believe a world class opera company like the Lyric needs a world class orchestra," she said. "Management has been demanding cuts that would forever diminish the quality of the orchestra and the quality of opera the company can produce." The nub of the issue is reducing both the size of the standing orchestra and the frequency of performances—a decade ago it was 90 a year, this season, 56. The radio broadcasts are also being scrapped. "We the musicians feel the slash and burn agenda management seems to have is going to destroy the company," said Hess. The Lyric opera management of course feels differently. "Lyric’s proposed terms would preserve musicians’ jobs that are among the highest paid and best working conditions in the region," the management said, in a statement. "Stated simply, the contract changes we seek are necessary for the financial future of Lyric. We urge the CFM and its members – our musician colleagues in this great artistic endeavor at Lyric – to accept our offer before further financial losses force a different outcome. It is the only path forward." I don't want to be too flip about this situation. I'm assuming it'll be resolved sooner than later, that ill feelings will be put aside and joyful collaboration will return. But anyone who has seen his or her share of Verdi and Puccini knows that the potential for tragedy is always lurking around the corner with opera, and this situation feels a bit more fraught than usual. The Lyric Opera is a tremendous asset to the city—when Boeing decided to locate its headquarters there, its executives picked Chicago over other candidates such as Denver or Dallas because, they said, they liked our opera. The greatest talents of the past 90 years have sung—and played—their hearts out on stage and from the pit at the Civic Opera House. It's a shame to see the magnificent facility fall silent when it should be alive with music and make-believe heartbreak. I'm hoping my union brothers and sisters who work hard to stay at the pinnacle of their profession, and the Hunger Games Herods setting the rules, can come to an understanding soon. From left to right, musicians Mark Fry, Mark Fisher, Bill Denton and Matt Comerford, striking members of the Lyric Opera Orchestra, perform Le Jeune's "Autant en le Vent" at their picket line in front of the Civic Opera House, Oct. 11, 2018. Reading this made me think of the famous Petrillo-led musicians strike that ran from 1942 to 1944 and had a number of unintended consequences, some good, some bad, depending on your point of view. Even Roosevelt couldn't stop that strike. Surely, Trump will have his say about this strike sooner or later. As memory serves, that was about the union trying to stop or limit the use of transcribed music instead of live performance on air. The union was still smarting from the loss of half its membership in the early thirties when the arrival of sound movies made redundant theater piano players. In that respect, it was nice that the Metropolitan Opera musicians texted support for their Chicago brethren, but not without irony in they are at least a small part of Lyric's declining audience problem. I know people who switched their opera going to a simulacrum of live performances at lower cost by going to Met broadcasts streaming into their local theater. Hoping our opera option doesn’t come down to that (live Met broadcasts in movie theaters). I’ve been to a few of those, and though they’re top-notch productions, they just don’t compare to seeing a live performance at the Lyric. Maybe someone will write an opera about this. Ha ha. OK, that wasn't funny. And I feel for the musicians. It can't be much fun devoting your life to a supremely demanding art while having to worry constantly about job security. OTOH, it's easy to slag on the bean counters, but meeting payroll and all the other expenses in the face of declining ticket sales can't be any day at the beach either. Other countries subsidize their fine arts, on the basis of how they're, you know, culturally worthwhile. But the Greatest Country on Earth can barely be bothered to give even token help to its most vulnerable citizens, much less spare a dime for anything of cultural significance (that isn't a sport). Damned if I know what the answer is. Personally, I'll start contributing to the Elgin Symphony, a superb regional ensemble, again (instrumental classical is much more my thing than opera), and maybe find the time to attend a couple performances at the Chicago Symphony and the Lyric. Opera singers do not move me. Perhaps that would change if I attended the opera, but i doubt it. It is something I endure in Marx Brothers movies. But I appreciate the talent involved and am not qualified to judge the musical tastes of others. So I hope The Lyric survives this trial . On this morning's walk I saw an ad for Kathleen Turner's debut at an opera somewhere, NYC I guess. Will opera survive this or will the fat lady finally sing? I was fortunate enough to be in the group you took to Faust last year and truly enjoyed it. I brought my 17 year old son as he had interest in seeing an opera and he was transfixed by it. The production helped I think, but know that you opened up a teenager to something he'll alway remember. I've caught him listening to opera when doing homework so I know it made an impression. Hope you don't completely give up on prompting opera. We need it to survive in this Lallapaloosa world.